This year’s Southern Illinois Field Trip was a huge success thanks to the cooperative weather and expertise of our leader, Keith McMullen. While COS has done this weekend excursion several times in the past, every year holds something new and exciting, and it is always a pleasure to explore this unique and beautiful region. Our group of 12 left bright and early Saturday morning and as soon as we exited the highway, the unfamiliar dawn chorus greeted us. Blue Grosbeaks, White-eyed Vireos, Summer Tanagers… all birds that would be great finds in Chicago were almost commonplace. As we neared the Shawnee, Mississippi Kites started to appear soaring just above the treetops and Red-shouldered Hawks were more often heard than seen. Black Vultures were helping to dispose of the previous night’s road kill. Our first official stop was at Cave Creek in Pomona. Pileated Woodpeckers, Acadian Flycatchers, and Yellow-billed Cuckoos were everywhere but the target here was warblers. A pair of Barred Owls were seen at ground level in the creek and a turf war began shortly after between a Prothonotary Warbler, Kentucky Warbler, Cerulean Warbler, and an American Redstart. We added Northern Parula, Pine Warbler, Yellow-throated Warbler, Hooded Warbler, Ovenbird, and Common Yellowthroat at nearby Pomona Natural Bridge. While most of the birds stayed up high, a Yellow-throated Warbler came down close for nice views and we got the scope on an Acadian Flycatcher nest. We also had an encounter with a stunning Copperhead Snake in the road. Further down the road we had scope views with a cooperative Yellow-breasted Chat and a male Blue Grosbeak. As we moved on, luckily with the windows down, a gorgeous male Prairie Warbler was singing away and gave some of the best views I’ve had of this species. We continued to rack up the warblers with another singing Worm-eating Warbler, and a shy Louisiana Waterthrush. We also got great looks at a male Scarlet Tanager in the Pine Hills area. A Black-and-white Warbler was a surprise as well… although abundant during migration, they are a rare breeding species in Illinois. A brief stop to check out singing Henslow’s Sparrows in a random field got us great looks at an Eastern Hognose Snake. We then headed to the floodplains to look for shorebirds and waders and were not disappointed. Little Blue Herons and Snowy Egrets seemed to be in every ditch, puddle, and pond. In Grand Tower, a large group of Black-necked Stilts were not thrilled by our presence as they were still tending to young. A brief detour to Missouri while we scoped Grand Tower Island to take in the hundreds of American White Pelicans, Great Egrets, and shorebirds. We had our only Cattle Egrets of the trip here, calling Fish Crows, and a flyover Bald Eagle. Our last stop in Alexander County was a nesting colony of Least Terns. These tiny, almost swallow-like terns are of the Interior subspecies which is state-endangered. Although distant, we got to see many birds hovering and diving in the small fluddles of a sandy field. After dinner at a local barbecue joint, we headed to Fern Clyffe State Park for some nighttime birding. We got to see another pair of Barred Owls here, likely recently fledged juveniles due to the fuzzy heads and the screeching calls. Shortly after sunset, Chuck-will’s-widows and Eastern Whip-poor-wills began calling. A Chuck-will’s Widow flew from the forest right over our heads and I was completely taken aback by its size. It proceeded to perch on a wooden post and flycatch for the next 10 minutes or so. One of many highlights on this trip! Another highlight was when a pair of Screech-owls which had been calling earlier flew across the road. We were able to get a flashlight near it to get great looks at both, one of which was a red morph. The next morning, we headed to Mermet Lake in Massac county. This is a sizeable lake surrounded by cypress swamp. The targets here were the nesting Common Gallinules and Least Bitterns. While the views of the bitterns were brief, the Common Gallinules were much more obliging as a family group with 3 chicks put on a show in front of us. We later saw an adult Bald Eagle perched in a tree, and a pair of Pileated Woodpeckers flying by. At one point we had an Orchard Oriole, a Yellow-billed Cuckoo, and Red-headed and Red-bellied Woodpeckers competing for our attention. It was hard to know where to look at times! Driving the back roads of Pulaski and Johnson counties to our next destination produced our first Yellow-crowned Night Herons of the trip. One stop at a scrubby patch along Post Creek in the Belknap area had Willow Flycatcher, Bell’s Vireo, Prairie Warbler, and several Yellow-breasted Chats. Our last stop, and always the highlight, was Heron Pond in Little Black Slough Nature Preserve. 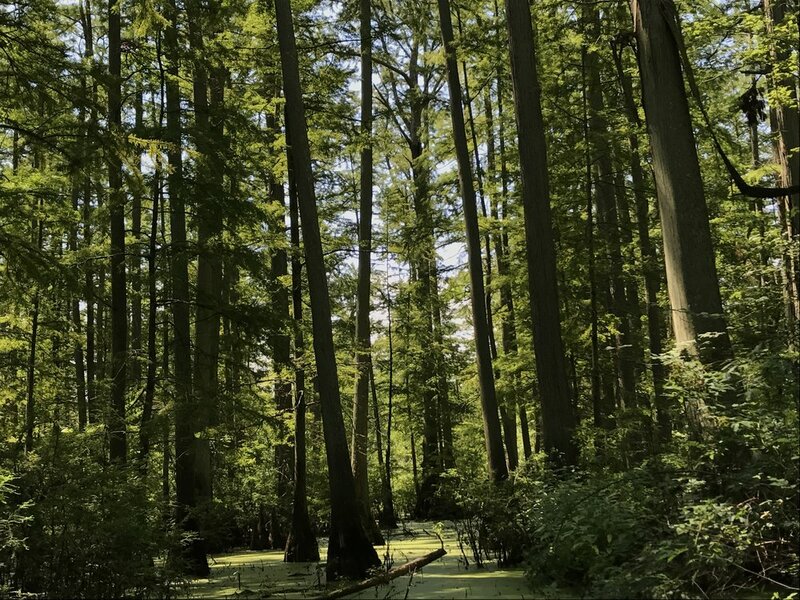 This unique and internationally important wetland is the largest IDNR property in the state, but our focus was the boardwalks through the cypress and tupelo swamp. It’s not often Prothonotary Warblers are your most numerous bird in one place! There were many interesting dragonflies, frogs, and plants here and although we did not get to see any snakes, a few juvenile Five-lined Skinks were a pleasant surprise. A few Yellow-crowned Night Herons were hunting and preening to the chorus of Yellow-throated Warblers and Northern Parulas. We continued on to the State Champion Cherrybark Oak Tree where a Kentucky Warbler gave great looks for those of us that missed the others. We took our tree selfies, and with 120 bird species under our belt, headed back to the parking lot to part ways. All in all we had a fantastic weekend appreciating what Little Egypt has to offer, and I am already thinking about my next trip down there. Keith McMullen leads trips for other groups, most notably the Fall Lake Carlyle trip through the Illinois Ornithological Society so keep a look out for news about those!